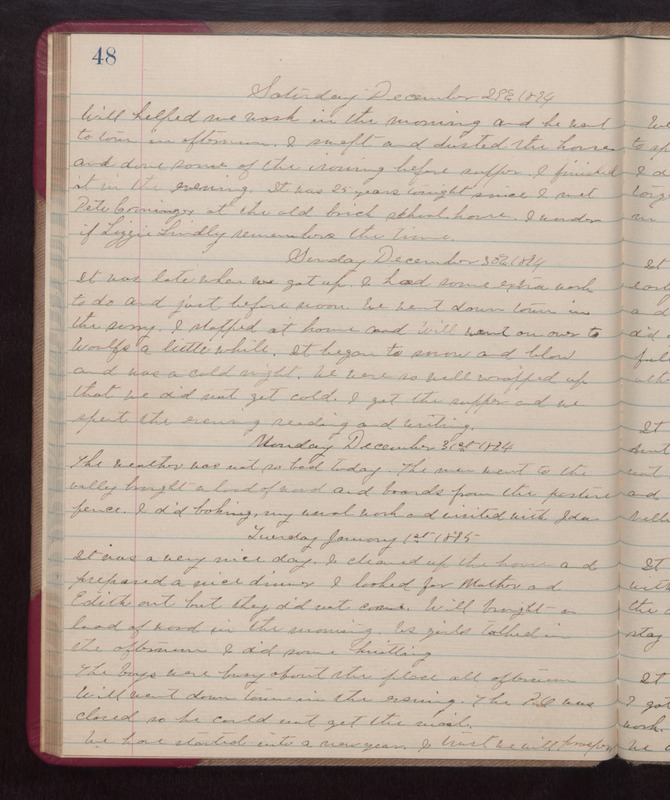 Saturday December 29th 1894 Will helped me wash in the morning and he went to town in afternoon. I swept and dusted the house and done some of the ironing before supper. I finished it in the evening. It was 25 years tonight since I met Pete Cominger at the old brick school house. I wonder if Lizzie Lindly remembers the time. Sunday December 30th 1894 It was late when we got up. I had some extra work to do and just before noon we went down town in the surrey. I stopped at home and Will went on over to Woolfs a little while. It began to snow and blow and was a cold night. We were so well wrapped up that we did not get cold. I got the supper and we spent the evening reading and writing. Monday December 31st 1894 The weather was not so bad today. The men went to the valley brought a load of wood and boards from the pasture fence. I did baking, my usual work and visited with Ida. Tuesday January 1st 1895 It was a very nice day. I cleaned up the house and prepared a nice dinner. I looked for Mother and Edith out but they did not some. Will brought a load of wood in the monring. Us girls talked in the afternoon. I did some knitting. The boys were busy about the place all afternoon. Will went downtown in the eevening. The P.O. was closed so he could not get the mail. We have started into a new year. I trust we will prosper.